The Ratchet Strap has an integrated ladder strap and ratchet buckle with NEW upgraded stainless steel components. 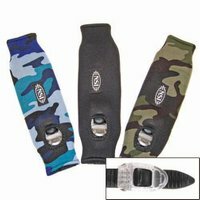 This accommodates a HUGE range of adjustment and easy on the water adjustment. Internal padding and neoprene cover provides cushy comfort with no hot spots. Sold individually. Two Shred Tech strap control washers included.